For the definition of another word, see Wiktionary. For other uses of the word "definition" itself, see Definition (disambiguation). A definition states the meaning of a word using other words. This is sometimes challenging. Common dictionaries contain lexical descriptive definitions but there are various types of definition - all with different purposes and focuses. In mathematics, a definition is used to give a precise meaning to a new term, instead of describing a pre-existing term. Definitions and axioms are the basis on which all of modern mathematics is constructed. "definiens" redirects here. For the company, see Definiens (company). In modern usage, a definition is something, typically expressed in words, that attaches a meaning to a word or group of words. The word or group of words that is to be defined is called the definiendum, and the word, group of words, or action that defines it is called the definiens. In the definition "An elephant is a large gray animal native to Asia and Africa", the word "elephant" is the definiendum, and everything after the word "is" is the definiens. The definiens is not the meaning of the word defined, but is instead something that conveys the same meaning as that word. There are many sub-types of definitions, often specific to a given field of knowledge or study. These include, among many others, lexical definitions, or the common dictionary definitions of words already in a language; demonstrative definitions, which define something by pointing to an example of it ("This," [said while pointing to a large grey animal], "is an Asian elephant. "); and precising definitions, which reduce the vagueness of a word, typically in some special sense ("'Large', among female Asian elephants, is any individual weighing over 5,500 pounds."). An intensional definition, also called a connotative definition, specifies the necessary and sufficient conditions for a thing being a member of a specific set. Any definition that attempts to set out the essence of something, such as that by genus and differentia, is an intensional definition. An extensional definition, also called a denotative definition, of a concept or term specifies its extension. It is a list naming every object that is a member of a specific set. Thus, the "seven deadly sins" can be defined intensionally as those singled out by Pope Gregory I as particularly destructive of the life of grace and charity within a person, thus creating the threat of eternal damnation. An extensional definition would be the list of wrath, greed, sloth, pride, lust, envy, and gluttony. In contrast, while an intensional definition of "Prime Minister" might be "the most senior minister of a cabinet in the executive branch of government in a parliamentary system", an extensional definition is not possible since it is not known who future prime ministers will be. A genus–differentia definition is a type of intensional definition that takes a large category (the genus) and narrows it down to a smaller category by a distinguishing characteristic (i.e. the differentia). a genus (or family): An existing definition that serves as a portion of the new definition; all definitions with the same genus are considered members of that genus. the differentia: The portion of the new definition that is not provided by the genus. a triangle: A plane figure that has three straight bounding sides. a quadrilateral: A plane figure that has four straight bounding sides. Those definitions can be expressed as a genus ("a plane figure") and two differentiae ("that has three straight bounding sides" and "that has four straight bounding sides", respectively). a square: a rectangle that is a rhombus. a square: a rhombus that is a rectangle. Thus, a "square" is a member of both the genus "rectangle" and the genus "rhombus". One important form of the extensional definition is ostensive definition. This gives the meaning of a term by pointing, in the case of an individual, to the thing itself, or in the case of a class, to examples of the right kind. So one can explain who Alice (an individual) is by pointing her out to another; or what a rabbit (a class) is by pointing at several and expecting another to understand. The process of ostensive definition itself was critically appraised by Ludwig Wittgenstein. An enumerative definition of a concept or term is an extensional definition that gives an explicit and exhaustive listing of all the objects that fall under the concept or term in question. Enumerative definitions are only possible for finite sets and only practical for relatively small sets. Divisio and partitio are classical terms for definitions. A partitio is simply an intensional definition. A divisio is not an extensional definition, but an exhaustive list of subsets of a set, in the sense that every member of the "divided" set is a member of one of the subsets. An extreme form of divisio lists all sets whose only member is a member of the "divided" set. The difference between this and an extensional definition is that extensional definitions list members, and not subsets. In classical thought, a definition was taken to be a statement of the essence of a thing. Aristotle had it that an object's essential attributes form its "essential nature", and that a definition of the object must include these essential attributes. The idea that a definition should state the essence of a thing led to the distinction between nominal and real essence, originating with Aristotle. In a passage from the Posterior Analytics, he says that the meaning of a made-up name can be known (he gives the example "goat stag"), without knowing what he calls the "essential nature" of the thing that the name would denote, if there were such a thing. This led medieval logicians to distinguish between what they called the quid nominis or "whatness of the name", and the underlying nature common to all the things it names, which they called the quid rei or "whatness of the thing". (Early modern philosophers like Locke used the corresponding English terms "nominal essence" and "real essence"). The name "hobbit", for example, is perfectly meaningful. It has a quid nominis. But one could not know the real nature of hobbits, and so the real nature or quid rei of hobbits cannot be known. By contrast, the name "man" denotes real things (men) that have a certain quid rei. The meaning of a name is distinct from the nature that thing must have in order that the name apply to it. This leads to a corresponding distinction between nominal and real definitions. A nominal definition is the definition explaining what a word means, i.e. which says what the "nominal essence" is, and is definition in the classical sense as given above. A real definition, by contrast, is one expressing the real nature or quid rei of the thing. This preoccupation with essence dissipated in much of modern philosophy. Analytic philosophy in particular is critical of attempts to elucidate the essence of a thing. Russell described essence as "a hopelessly muddle-headed notion". More recently Kripke's formalisation of possible world semantics in modal logic led to a new approach to essentialism. Insofar as the essential properties of a thing are necessary to it, they are those things it possesses in all possible worlds. Kripke refers to names used in this way as rigid designators. A definition may also be classified as an operational definition or theoretical definition. A homonym is, in the strict sense, one of a group of words that share the same spelling and pronunciation but have different meanings. Thus homonyms are simultaneously homographs (words that share the same spelling, regardless of their pronunciation) and homophones (words that share the same pronunciation, regardless of their spelling). The state of being a homonym is called homonymy. Examples of homonyms are the pair stalk (part of a plant) and stalk (follow/harass a person) and the pair left (past tense of leave) and left (opposite of right). A distinction is sometimes made between "true" homonyms, which are unrelated in origin, such as skate (glide on ice) and skate (the fish), and polysemous homonyms, or polysemes, which have a shared origin, such as mouth (of a river) and mouth (of an animal). Polysemy is the capacity for a sign (such as a word, phrase, or symbol) to have multiple meanings (that is, multiple semes or sememes and thus multiple senses), usually related by contiguity of meaning within a semantic field. It is thus usually regarded as distinct from homonymy, in which the multiple meanings of a word may be unconnected or unrelated. In mathematics, definitions are generally not used to describe existing terms, but to describe or characterize a concept. For naming the object of a definition mathematicians can use either a neologism (this was mainly the case in the past) or words or phrases of the common language (this is generally the case in modern mathematics). The precise meaning of a term given by a mathematical definition is often different than the English definition of the word used, which can lead to confusion, particularly when the meanings are close. For example a set is not exactly the same thing in mathematics and in common language. In some case, the word used can be misleading; for example, a real number has nothing more (or less) real than an imaginary number. Frequently, a definition use a phrase built with common English words, which has no meaning outside mathematics, such as primitive group or irreducible variety. Authors have used different terms to classify definitions used in formal languages like mathematics. Norman Swartz classifies a definition as "stipulative" if it is intended to guide a specific discussion. A stipulative definition might be considered a temporary, working definition, and can only be disproved by showing a logical contradiction. In contrast, a "descriptive" definition can be shown to be "right" or "wrong" with reference to general usage. Swartz defines a precising definition as one that extends the descriptive dictionary definition (lexical definition) for a specific purpose by including additional criteria. A precising definition narrows the set of things that meet the definition. C.L. Stevenson has identified persuasive definition as a form of stipulative definition which purports to state the "true" or "commonly accepted" meaning of a term, while in reality stipulating an altered use (perhaps as an argument for some specific belief). Stevenson has also noted that some definitions are "legal" or "coercive" – their object is to create or alter rights, duties, or crimes. At least one thing is stated to be a member of the set being defined; this is sometimes called a "base set". All things bearing a certain relation to other members of the set are also to count as members of the set. It is this step that makes the definition recursive. "0" is a natural number. no natural number is succeeded by "0". Nothing else is a natural number. So "0" will have exactly one successor, which for convenience can be called "1". In turn, "1" will have exactly one successor, which could be called "2", and so on. Notice that the second condition in the definition itself refers to natural numbers, and hence involves self-reference. Although this sort of definition involves a form of circularity, it is not vicious, and the definition has been quite successful. A parent is an ancestor. A parent of an ancestor is an ancestor. Nothing else is an ancestor. Or simply: an ancestor is a parent or a parent of an ancestor. Certain rules have traditionally been given for definitions (in particular, genus-differentia definitions). A definition must set out the essential attributes of the thing defined. Definitions should avoid circularity. To define a horse as "a member of the species equus" would convey no information whatsoever. For this reason, Locking[specify] adds that a definition of a term must not consist of terms which are synonymous with it. This would be a circular definition, a circulus in definiendo. Note, however, that it is acceptable to define two relative terms in respect of each other. Clearly, we cannot define "antecedent" without using the term "consequent", nor conversely. The definition must not be too wide or too narrow. It must be applicable to everything to which the defined term applies (i.e. not miss anything out), and to nothing else (i.e. not include any things to which the defined term would not truly apply). The definition must not be obscure. The purpose of a definition is to explain the meaning of a term which may be obscure or difficult, by the use of terms that are commonly understood and whose meaning is clear. The violation of this rule is known by the Latin term obscurum per obscurius. However, sometimes scientific and philosophical terms are difficult to define without obscurity. A definition should not be negative where it can be positive. We should not define "wisdom" as the absence of folly, or a healthy thing as whatever is not sick. Sometimes this is unavoidable, however. For example, it appears difficult to define blindness in positive terms rather than as "the absence of sight in a creature that is normally sighted". Given that a natural language such as English contains, at any given time, a finite number of words, any comprehensive list of definitions must either be circular or rely upon primitive notions. If every term of every definiens must itself be defined, "where at last should we stop?" A dictionary, for instance, insofar as it is a comprehensive list of lexical definitions, must resort to circularity. Many philosophers have chosen instead to leave some terms undefined. The scholastic philosophers claimed that the highest genera (the so-called ten generalissima) cannot be defined, since a higher genus cannot be assigned under which they may fall. Thus being, unity and similar concepts cannot be defined. Locke supposes in An Essay Concerning Human Understanding that the names of simple concepts do not admit of any definition. More recently Bertrand Russell sought to develop a formal language based on logical atoms. Other philosophers, notably Wittgenstein, rejected the need for any undefined simples. Wittgenstein pointed out in his Philosophical Investigations that what counts as a "simple" in one circumstance might not do so in another. He rejected the very idea that every explanation of the meaning of a term needed itself to be explained: "As though an explanation hung in the air unless supported by another one", claiming instead that explanation of a term is only needed to avoid misunderstanding. Locke and Mill also argued that individuals cannot be defined. Names are learned by connecting an idea with a sound, so that speaker and hearer have the same idea when the same word is used. This is not possible when no one else is acquainted with the particular thing that has "fallen under our notice". Russell offered his theory of descriptions in part as a way of defining a proper name, the definition being given by a definite description that "picks out" exactly one individual. Saul Kripke pointed to difficulties with this approach, especially in relation to modality, in his book Naming and Necessity. ^ Terms with the same pronunciation and spelling but unrelated meanings are called homonyms, while terms with the same spelling and pronunciation and related meanings are called polysemes. ^ Note that one learns inductively, from ostensive definition, in the same way, as in the Ramsey–Lewis method. ^ a b c Lyons, John. "Semantics, vol. I." Cambridge: Cambridge (1977). p.158 and on. ^ Katerina Ierodiakonou, "The Stoic Division of Philosophy", in Phronesis: A Journal for Ancient Philosophy, Volume 38, Number 1, 1993, pp. 57–74. ^ "Linguistics 201: Study Sheet for Semantics". Pandora.cii.wwu.edu. Retrieved 2013-04-23. ^ "Norman Swartz - Biography". sfu.ca. ^ a b c d e McPherson, M.; Arango, P.; Fox, H.; Lauver, C.; McManus, M.; Newacheck, P. W.; Perrin, J. M.; Shonkoff, J. P.; Strickland, B. (1998). "A new definition of children with special health care needs". Pediatrics. 102 (1 Pt 1): 137–140. doi:10.1542/peds.102.1.137. PMID 9714637. ^ a b c Morse, R. M.; Flavin, D. K. (1992). "The Definition of Alcoholism". JAMA. 268 (8): 1012–1014. doi:10.1001/jama.1992.03490080086030. PMID 1501306. ^ This problem parallels the diallelus, but leads to scepticism about meaning rather than knowledge. ^ An exercise suggested by J. L. Austin involved taking up a dictionary and finding a selection of terms relating to the key concept, then looking up each of the words in the explanation of their meaning. Then, iterating this process until the list of words begins to repeat, closing in a "family circle" of words relating to the key concept. ^ In the game of Vish, players compete to find circularity in a dictionary. Copi, Irving (1982). Introduction to Logic. New York: Macmillan. ISBN 0-02-977520-5. McKean, Erin (2001). Verbatim: From the bawdy to the sublime, the best writing on language for word lovers, grammar mavens, and armchair linguists. Harvest Books. ISBN 0-15-601209-X. Macagno, Fabrizio; Walton, Douglas (2014). Emotive Language in Argumentation. New York: Cambridge University Press. Robinson, Richard (1954). Definition. Oxford: At The Clarendon Press. ISBN 978-0-19-824160-7. Simpson, John; Edmund Weiner (1989). 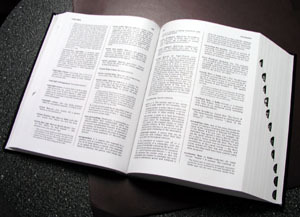 Oxford English Dictionary, second edition (20 volumes). Oxford University Press. ISBN 0-19-861186-2. Wittgenstein, Ludwig (1953). Philosophical Investigations. Blackwell Publishing. ISBN 0-631-23127-7. Look up definition in Wiktionary, the free dictionary. Guy Longworth (ca. 2008) "Definitions: Uses and Varieties of". = in: K. Brown (ed. ): Elsevier Encyclopedia of Language and Linguistics, Elsevier. Definition and Meaning, a very short introduction by Garth Kemerling (2001).